Darkstalker Kaathe is a Character in Dark Souls. He is a Primordial Serpent, just like Kingseeker Frampt. He is the Leader of the Darkwraiths Covenant, and he who tempted The Four Kings with the power of Life Drain which led to the eventual flooding of New Londo. Note: Darkstalker Kaathe will not show up if you went with Frampt and placed the Lordvessel. If you have obtained the Lordvessel, you can go to New Londo Ruins and talk to Ingward. Ingward will give you a key that' will eventually lead to the Four Kings boss (requires you defeat Great Grey Wolf Sif first to be able to walk The Abyss.) After defeating the Four Kings, Darkstalker Kaathe will appear in The Abyss. He allows you to join the Darkwraith Covenant. If you have not obtained the Lordvessel yet, you can kill Ingward instead to get the key, however be sure to buy his Cure Curse spell beforehand. I can guide thee, and illuminate the truth. Undead Warrior, conqueror of the Four Kings, is this not your wish? To know the truth of men, and the Undead?" "A wise choice, Undead warrior. Warriors as yourself are few. I will be patient. But I cannot wait forever…"
Perhaps you have changed your mind?" the legendary power of the Dark Lord. and cast off the shackles placed upon your brethren." To speak now is premature. It begins with your retrieval of the Lordvessel." and become the Fourth Lord, so that you may usher in the Age of Dark!" Be still. Entrust thine flesh to me." "Fool… You could not be the Dark Lord. I shall return to the Abyss, and await the true Lord of Men. Now, place the Lordvessel upon the altar. What is it? Place the Lordvessel upon the altar." Once the vessel is filled with souls, the gate to Gwyn shall open. Seek Gravelord Nito, the Witch of Izalith, and the traitor Seath the Scaleless. Fill this vessel with their souls. Then, the gate will open… so that you may kill Gwyn. Then, let us return to the Abyss. Entrust thine flesh to me. Go on, state your wish." "They failed me, every last one of them. They were strong, but saw not the truth. I am certain that you will prove different." I shall return to the Abyss, and await the true Lord of Men." This has likely already been said but if you accidentally talk to Frampt and get brought down to place the Lordvessel, use a homeward bone to warp out of the area BEFORE placing it. Being brought to the area doesn&apos;t bar you from meeting Kathe, only placing the vessel with Frampt does. You can still meet Kathe after the 4 kings (just did this with my character). He will transport you to place the Lordvessel and offer the Darkwraith covenant after you do. Hopefully this helps with any confusion. Can I get him by simply "killing" framt aswell? 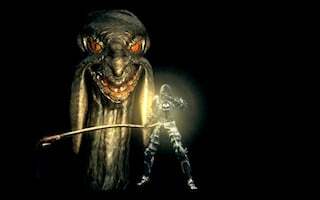 Also worth pointing out, since you can&apos;t reach Sif in the Chasm of the Abyss without placing the Lordvessel for Frampt, you can&apos;t get the alternate cutscene for Sif if you go with Kaathe. age of men is just a lie .dark soul like the lord soul came from first flame,with flame fading humans can not rule too,he just wants good for his race. "MANUS WAITED FOR FIRE TO SUBCIDE"is a lie too. Do I need to have him transport me to the area that I place the lord vessel at to join the covenant, or does he let you join the covenant regardless? Edit ...one would have to KILL Ingward. What if I jump to the alter myself and placed the lord vessel? If you become the lord of dark frampt and kathee will kneel before you have you got any lore about this?